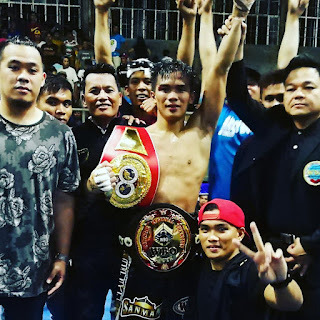 Press Release: April 30, 2018 By Sanman Promotions – Jade Bornea prevailed in the battle of unbeaten fighters after he scored a unanimous win over Danrick Sumabong in the main event of the "Undefeated" fight card last Saturday night (April 28th) in Glan, Saranggani Province. In keeping his unblemished record intact, Bornea (10W-0L-0D, 7KOs) wrested the vacant WBO Youth Super-Flyweight belt. Sumabong proved to be a tough nut to crack but ultimately fell short versus Bornea en route to tasting his first loss after starting his pro career with five straight wins. In the undercard fights, Mark Bernaldez marked his return from a long hiatus with a smashing first-round knockout win over JP Macadumpis. 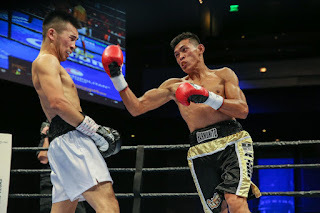 Fighting for the first time since August 5, 2015, Bernaldez improved to 16W-1L-1D, 11KOs as he scored a rousing debut as a Sanman Boxing Gym fighter. Macadumpis fell to 11W-12L-1D, 5KOs. Also scoring an impressive win was Ken Jordan (7W-1L-1D, 6KOs), who knocked out Wiljan Ugbaniel (13W-8L-1D, 4KOs) in the very first round. 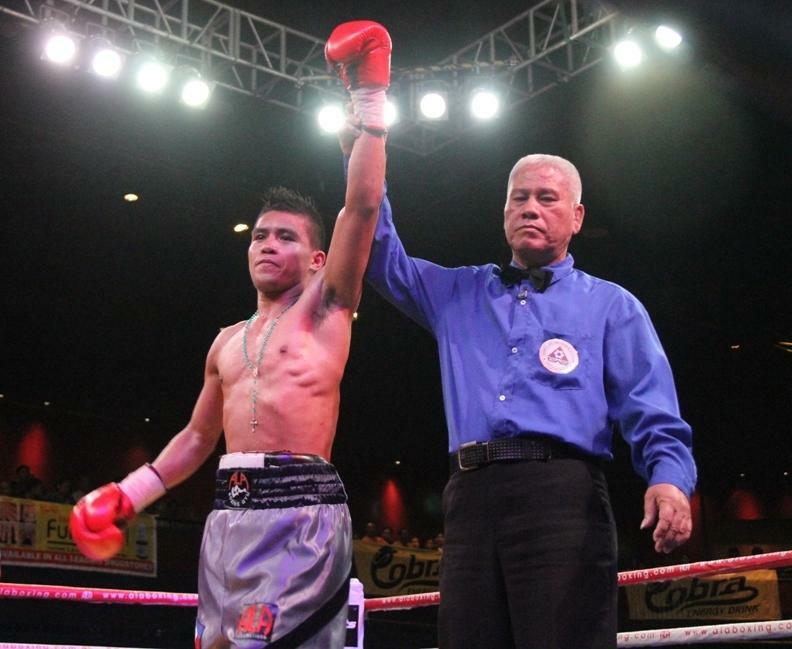 Ernie Sanchez, on the other hand, dispatched Noel Adelmita in the second round to hike his record to 18W-11L-1D, 9KOs. Adelmita slid to 13W-13L-2D, 2KOs. In other fights, Jayson Franciso defeated Sardido via unanimous decision, Japan's Motoki Osanai knocked out Alvin Bais in the second round, while Regie Mananquil pulled off a unanimous win over Roger Sulaton in the card promoted by Sanman Promotions of CEO Jim Claude Manangquil. Due to circumstances beyond our control the previously announced double feature looking back at some of the events that took place in Boxing on Saturday, April 21st will not be released as originally planned. Material regarding the subject will be released as part of a special edition of the regular feature Observations On Recent Events In Boxing discussing the first half of 2018, which will be released during the month of June. We apologize for the delay. We would also like to let our readers know that we will resume our regular schedule on Saturday, May 5th. Stay tuned. "And That's The Boxing Truth." 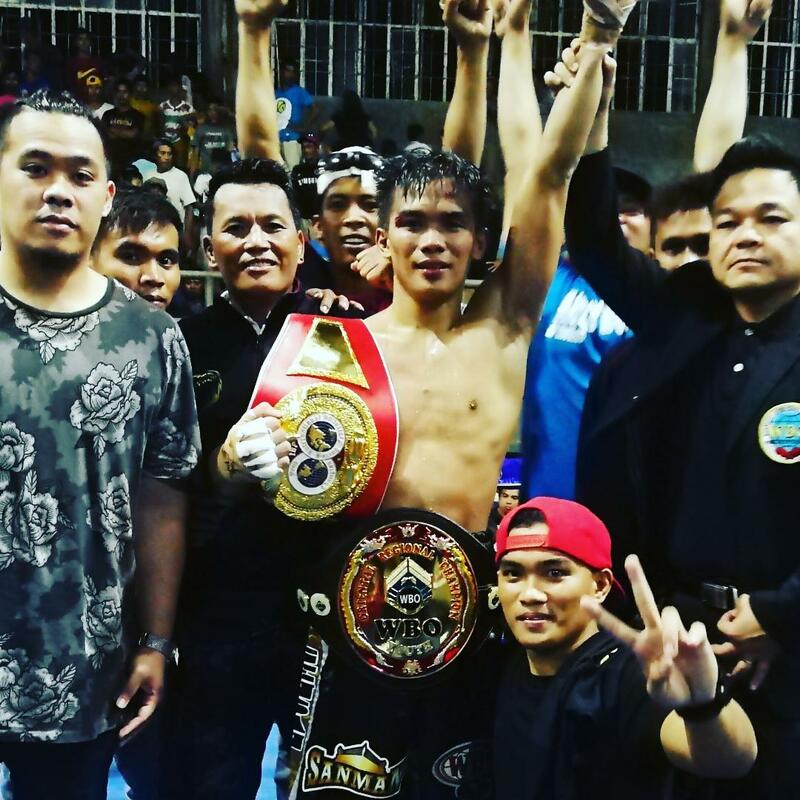 Press Release: April 22, 2018 by Sanman Promotions – It’s all systems go for the upcoming “Undefeated” fight card scheduled on April 28 in Glan, Saranggani Province. 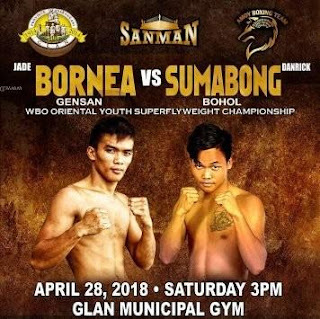 Youthful boxing promoter Jim Claude Manangquil, CEO of the General Santos City-based Sanman Promotions, announced that the full card has already been finalized with Jade Bornea taking on Danrick Sumabong in the main event. Bornea (10W-0L-0D, 7KOs) and Sumabong (5W-0L-0D, 4KOs) will fight for the vacant World Boxing Organization (WBO) Youth Super-Flyweight title. “This is going to be an exciting card with two undefeated fighters facing off in the main event,” said Manangquil. The main undercard will have Sanman Boxing Gym’s Harmonito “Hammer” dela Torre colliding with Jovany Rota. Dela Torre is looking to get back on track after dropping his last assignment against Olympian Tugstsogt Nyambayar in Las Vegas, Nevada USA in November last year. Dela Torre sports a 19W-1L-0D, 12KOs record, while Rota has nine wins (6KOs) and 13 losses. Ernie Sanchez (17W-11L-1D, 8KOs) will take on Noel Adelmita (13W-12L-2D, 2KOs), while Jake Bornea (13W-2L-0D, 7KOs) will test the mettle of Wiljan Ugbaniel (13W-7L-1D, 4KOs). The other undercard duels will have Jayson Francisco (4W-1L-0D, 1KO) battling Janjan Santos (1W-8L-1D) and Motoki Osanai (1W-2L) slugging it out with Alvin Bais (14W-11L-1D, 4KOs). Also, Mark Benaldez (15W-1L-0D, 10KOs) will make his debut under the Sanman Boxing Gym when he squares off with JP Macadumpis (11W-11L-1D, 5KOs). Completing the fight card is the showdown between Regie Mananquil and Roger Salaton. Saturday’s loaded Boxing lineup continues. Below are the official weights from Friday’s Weigh-ins featuring a card headlined by a Heavyweight bout between former two-division world champion Tomasz Adamek and Heavyweight contender Joey Abell taking place in Poland and a card in Brooklyn New York headlined by a battle between former world champions Jessie Vargas and Adrien Broner in the Welterweight division. Main Event: Polish International Heavyweight championship – 10Rds. Tomasz Adamek (Champion) 226 1/2lbs. vs. Joey Abell (Challenger) 254 1/2lbs. Vacant WBO European Cruiserweight championship – 12Rds. Mateusz Masternak 199 1/4lbs. vs. Youri Kalenga 198 1/4lbs. WBO Women’s Jr. Lightweight world championship – 10Rds. Ewa Brodnicka (Champion) 129 3/4lbs. vs. Sarah Pucek (Challenger) 131lbs. Vacant Polish International Cruiserweight championship – 10Rds. Denis Grachev 191 1/4lbs. vs. Adam Balski 199 1/4lbs. Polish Welterweight championship – 10Rds. Lukasz Wierzbicki (Champion) 146 1/4lbs. vs. (Challenger) Michal Zerominski 146 3/4lbs. Tim Cronin 177lbs. vs. Robert Parzeczewski 175 1/4lbs. Marcos Cornejo 160 3/4lbs. vs. Damian Jonak 161 1/4lbs. Michal Chudecki 142lbs. vs. Damian Wrzesinski 138lbs. Adamek vs. Abell takes place Tonight (Saturday, April 21st) at the Sports Hall in Czestochowa, Poland. The card can be seen in Poland on pay-per-view on cable and satellite providers. Contact your local cable/satellite provider for more information. The card can be seen outside of Poland on internet pay-per-view on www.ipla.tv for $13. The card will begin at 11:45AM (Saturday morning) U.S. EST. Jessie Vargas 143 3/4lbs. vs. Adrien Broner 144lbs. Jesus Cuellar 129 1/4lbs. vs. Gervonta Davis 129lbs. Jermall Charlo 160lbs. vs. Hugo Centeno 158 1/2lbs. Vargas vs. Broner takes place Tonight (Saturday, April 21st) at the Barclays Center in Brooklyn, NY. The card can be seen in the United States on Showtime across cable and satellite providers as well as streamed live on the Showtime and Showtime Anytime apps beginning at 9PM ET/6PM PT. For more information about Showtime, Showtime Sports, and the Showtime and Showtime Anytime apps as well as a list of available streaming devices please visit: www.sho.com. Check your listings internationally. Saturday’s loaded Boxing schedule features several intriguing bouts taking place across the globe. We here will at The Boxing Truth® will be covering all the action in two upcoming features that will be released next week. We will also be releasing weigh-in and broadcast information for these events in two separate reports. Below are the official weigh-in results that took place earlier today in the United Kingdom for two events. The first event will be headlined by former unified WBA/WBC Jr. Welterweight world champion Amir Khan as he will return to the ring after a near two year absence to face Welterweight contender Phil Lo Greco in Liverpool, England. Also taking place in the United Kingdom on Saturday will be a card in Belfast, Northern Ireland, which will be headlined by a battle for interim championship status in the World Boxing Organization’s (WBO) Featherweight rankings between former world champions Carl Frampton and Nonito Donaire. Main Event: Jr. Middleweight – 12Rds. Amir Khan 150lbs. vs. Phil Lo Greco 149 1/4lbs. Commonwealth Lightweight Championship – 12Rds. Sean Dodd (Champion) 134lbs. vs. Tommy Coyle (Challenger) 134 1/4lbs. Anthony Fowler 155 1/4lbs. vs. Ryan Toms 154 1/4lbs. Women’s Jr. Lightweight – 10Rds. Taoussy L’ Hadji 128 1/4lbs. vs. Natasha Jones 129 1/2lbs. Conor Benn 148lbs. vs. Chris Truman 144 1/4lbs. Sam Eggington 154 3/4lbs. vs. Achilles Szabo 156 1/4lbs. Laszlo Fazekas 159 1/4lbs. vs. Scott Fitzgerald 158 1/2lbs. Oais Ashfaq 123 1/4lbs. vs. Ricky Starkey 122 1/4lbs. Jose Hernandez 122lbs. vs. Osman Aslam 121 1/2lbs. Tom Ferrell 144 3/4lbs. vs. Mwenya Chisanga 142 1/4lbs. Craig Glover 207 1/4lbs. vs. Ratu Latianara 201 3/4lbs. Bilal Rehman 146 1/4lbs. vs. Edvinas Puplauskas 145 1/4lbs. Khan vs. Lo Greco takes place tomorrow (Saturday, April 21st) at the Echo Arena in Liverpool, England. The card can be seen in the United States on the new streaming digital network from ESPN, ESPN+ with undercard bouts beginning at 1:30PM ET/ 10:30AM PT with the main event scheduled to begin at approximately 5PM ET/2PM PT. ESPN+ is available through the ESPN app for $4.99 a month or $49.99 per year. To subscribe to ESPN+ Click the ESPN+ tab within the ESPN app or visit: watch.espnplus.com/sports/ to subscribe as well as for a list of available streaming devices carrying the ESPN app. For more information about ESPN please visit: www.espn.com. In the United Kingdom the card can be seen on Sky Sports Action beginning at 7PM (Local UK Time) The main event will also be shown on Sky Sports Main Event (Formally Sky Sports 1) beginning at 9:45PM (Local UK Time). For more information about Sky Sports please visit: www.skysports.com. Check your listings internationally. Carl Frampton 125lbs. vs. Nonito Donaire 125 1/2lbs. WBO Bantamweight world championship – 12Rds. Zolani Tete (Champion) 116 1/4lbs. vs. Omar Narvaez 117 1/4lbs. Vacant WBO European Middleweight championship – 10Rds. Conrad Cummings 159 1/2lbs. vs. Luke Keeler 159 1/4lbs. David Joyce 132 1/2lbs. vs. Jordan Ellison 132 3/4lbs. Christian Gomez 160lbs. vs. Troy Williamson 160 3/4lbs. Elvis Guillen 123 1/2lbs. vs. Tyrone McCullagh 127 1/4lbs. Sam Maxwell 142 1/2lbs. vs. Michael Carrero 140 3/4lbs. Marco McCullough 131 1/2lbs. vs. Arnoldo Solano 133 1/4lbs. Scott James 151lbs. vs. Lewis Crocker 153 1/2lbs. Lee Carter 268lbs. vs. Alex Dickinson 222lbs. Frampton vs. Donaire takes place tomorrow (Saturday, April 21st) at the SSE Arena in Belfast, Northern Ireland. The card can be seen for free in the United States on Showtime Boxing’s official Facebook and YouTube pages beginning at 5:15PM ET/2:15PM PT at the following links: https://www.youtube.com/watch?v=WDm00h4WYfg www.facebook.com/ShoBoxing. In the United Kingdom the card can be seen on BoxNation beginning at 7:30PM (Local UK Time). For more information about BoxNation please visit: www.boxnation.com. Press Release: April 18, 2018 by Hosking Promotions – WBA #6, IBF #5, WBC #5 Undefeated Australian boxing sensation Andrew “The Monster” Moloney 16 (10 KOs) - 0 returns to the ring for his second outing of 2018. “I have watched a few of Claveras fights now. I can see that he is a strong fighter and know that he is going to come here to fight. He has a come forward style and lets his hands go, so I’m sure the fans will be in for a real treat on May 19. 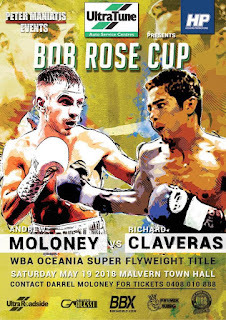 Hosking Promotions & Peter Maniatis Events presents BOB ROSE CUP May 19th in Melbourne Australia. Material and Photo courtesy of Hosking Promotions Used with permission. For more information about Hosking Promotions please visit Hosking Promotions’ official Facebook page: www.facebook.com/HoskingPromotions. 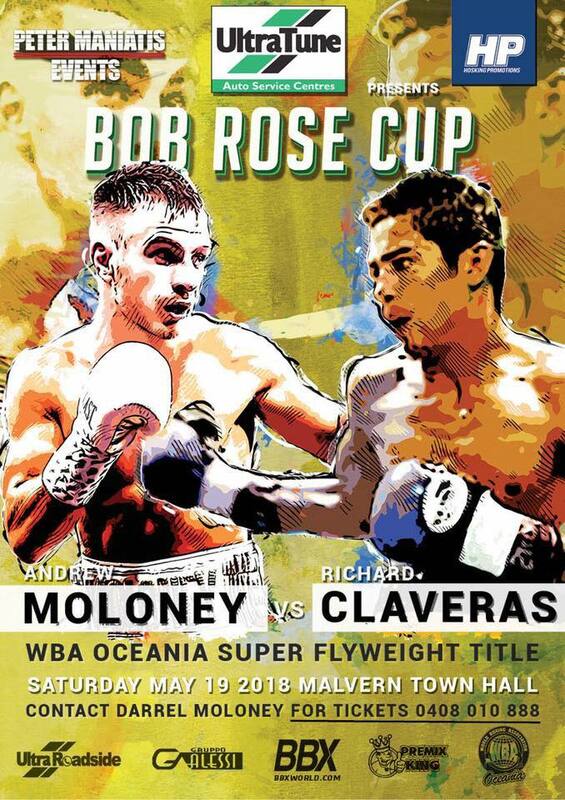 Follow Andrew Moloney by visiting his official Facebook page: www.facebook.com/AndrewMoloneyBoxing. Is Ryota Murata Ready For The Top Of The Middleweight Division? One could make a valid argument that the most significant story in the sport of Boxing currently is the situation that resulted in the highly anticipated rematch between undefeated unified WBA/IBO/WBC/IBF Middleweight world champion Gennady Golovkin and Saul Alvarez imploding. Although the subject of that situation is a column of it’s own for another time, what can be overshadowed when so much of the attention is focused on a particular fighter or in this case, two fighters who have become marquee stars are other events that go on in the same weight class where those marquee stars ply their trade. Some may recall one month after Golovkin and Alvarez squared off in September of last year in what was ruled a controversial draw, a bout took place in Tokyo, Japan between two of the Middleweight division’s top contenders to determine interim/regular champion status in the World Boxing Association’s (WBA) Middleweight ratings. A rematch between a former world champion and a top contender of a fight that also had a disputed outcome. On October 22nd of last year former WBO Middleweight world champion Hassan N’Dam faced previously unbeaten Ryota Murata. N’Dam, who had defeated Murata via twelve round split decision in May of last year, was gradually broken down by Murata who was able to stop the former world champion in seven rounds in what was frankly a one-sided fight. The impressive victory however, did garner attention particularly here in the United States. Murata, who won an Olympic gold medal in the Middleweight division in the 2012 Olympics in London, England had carved out an impressive professional record prior to his rematch with N’Dam in scoring twelve victories in his thirteen pro bouts and had scored nine knockouts in those wins. Avenging his only loss as a professional created attention not only because of the impressive way in which Murata was able to break his opponent down, but also because his rematch with N’Dam focused the spotlight on a segment of the sport that has not always received the attention and television exposure here in America that it has long deserved, the Japanese Boxing scene. If Murata’s victory over N’Dam established him as a fighter to watch in the Middleweight division, his next bout offered an opportunity to both build momentum as well as increase a growing fan base in the United States. On April 15th Murata faced former European Middleweight champion Emanuele Blandamura at the Yokohama Arena in Yokohama, Japan. A fight that like his rematch with N’Dam was broadcast not only in Japan, but also the United States by ESPN. Although the native of Rome, Italy Blandamura entered the fight with an impressive record of his own of 27-2, with 5 Knockouts and had recently relinquished his European championship to face Murata, he simply could not find a way to keep Murata, a native of Tokyo, Japan off of him. For eight rounds Murata used his come forward style to apply consistent pressure on Blandamura and as was the case in his previous bout against Hassan N’Dam, gradually broke his opponent down. Blandamura was able to have some success in using his movement to evade Murata for a period of time and did attempt to throw short combinations, but he simply could not land anything to discourage Murata from coming forward. Murata frequently pressed his opponent against the ropes as the fight progressed and brought an end to the bout in round eight dropping Blandamura with a flush overhand right that sent the former European champion down to the canvas. Even though Blandamura showed his mettle by getting up from the knockdown, the fight was stopped by Referee Raul Caiz Jr. seconds before the round was to end. It was a systematic and dominant performance by a fighter who has quietly established himself as a force to be reckoned with in the Middleweight division while much of the attention focused on the division has been centered elsewhere. The question now becomes whether Ryota Murata is ready to face some of the top fighters in the division? Although Murata does hold interim/regular champion status in the WBA Middleweight ratings, which in reality makes him the number one contender in the WBA for current unified world champion Gennady Golovkin, this observer is not sure whether he is ready for that high of a step up in caliber of opposition at this stage of his career. Despite the ongoing situation between Golovkin and Alvarez, which has Golovkin now facing Vanes Martirosyan in what will be the twentieth defense of his championship against on May 5th, which was to be the scheduled date of the Golovkin-Alvarez rematch, I cannot see Murata being rushed into a fight of that magnitude so quickly. There are however, some interesting options that could be available to Murata against some of the top contenders in the division and perhaps the second world champion in the division if what would be a mandatory title defense for Golovkin, assuming he is successful in his defense against Martirosyan is not in Murata’s near future. There are two possibilities that I believe could be viable options for Murata and they are potentially facing the winner’s of either the upcoming bouts between top Middleweight contender Daniel Jacobs and Marciej Sulecki, which will take place in Brooklyn, NY on April 28th or June 23rd clash between undefeated WBO world champion Billy Joe Saunders and Martin Murray. Both of these fights feature fighters who are either at the top of the division as Saunders currently is, or have faced other top opposition in the division including Gennady Golovkin as both Jacobs and Murray have. While it is also not out of the realm of possibility to see a fighter in Murata’s position as a fighter holding interim/regular champion status looking to stay busy before getting his opportunity at the current WBA world champion as many fighters have done over the years, this observer believes an encounter with the winner of either of these two fights could provide Murata with the best possible route to an encounter with the Golovkin-Martirosyan winner that would not necessarily involve taking the fight on short notice or having to wait a significant period of time while facing other opposition before getting his opportunity to fight for the world championship as has been the case for numerous fighters who have held interim/regular champion status in the WBA’s ratings throughout the entire sport over the years. The future however, does indeed look bright for Ryota Murata, a man some have called the new face of Japanese Boxing. If Murata can continue to win and increase his standing in the sport, it could lead to more of the Japanese Boxing scene and many great fighters receiving valuable television exposure and an opportunity to grow their respective fan bases here in the United States. It is something that is frankly long overdue. 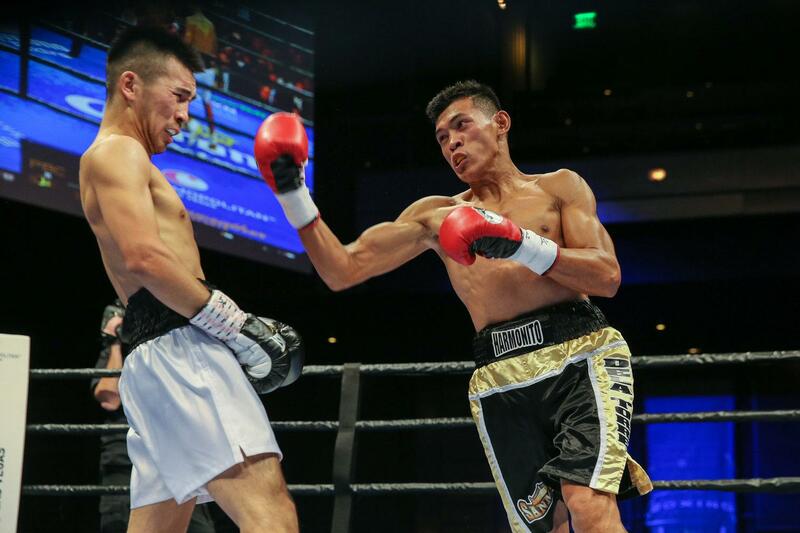 Press Release: April 15, 2018 by Sanman Promotions – Looking to resurrect his career after stumbling to his first career loss, super featherweight prospect Mark Vincent Bernaldez has decided to sign up with Sanman Boxing Gym in General Santos City. Bernaldez believed that Sanman, headed by CEO Jim Claude Manangquil, will help him realize his dream of becoming a world champion. “I chose Sanman to handle my career because I can see that they are very dedicated to boxing. They give opportunities to their boxers to become world champions. Some of my stablemates in other boxing clubs are already world champions because they were given opportunities,” said the 26-year-old Bernaldez. The 5-foot-6 Bernaldez is a former stalwart of the ALA Boxing Gym. He started his career with 15 straight wins before absorbing a technical knockout loss to Tsuyoshi Tameda last August 5, 2018 in Japan. “I think the fight in Japan was my hardest fight in my career,” said Bernaldez, who has not seen action since that loss to Tameda. “I didn’t have enough preparation for that fight and that’s the reason why I lost. I was so disappointed that’s why I stopped boxing for a while. But now I am back and I will prove to everyone that I have what it takes to become a world champion,” said Bernaldez, owner of 10 knockout victories. Bernaldez said having the right discipline, hard work and dedication were the traits he learned from his stint with the ALA Gym. “I will use the things I learned from my previous gym to realize my dreams. I am hoping that my fans will continue to support me. I will do my best to give pride to my family and Sanman,” said Bernaldez. Manangquil, for his part, said Bernaldez has the qualities to become the next big thing in boxing. “Bernaldez is great a boxer and has a big chance to become a world champion. One or two fights here in the Philippines just to shake off the rust and after that maybe a regional title fight then we will bring him to the United States,” said Mananquil. Bernaldez will be ending his long hiatus when he sees action in the undercard of the upcoming “Undefeated” fight card on April 28th in Glan, Saranggani Province.